It announced the new Masters champion as someone chasing everything again. Jack Nicklaus' 18 Majors; Sam Snead's 82 PGA Tour victories; Nicklaus' six Green Jackets. Woods talked of "just plodding" his away around the most murderous topography in golf, but it never remotely felt humdrum or banal. Certainly not now as the great throng roared his name. "Tiger, Tiger, Tiger." He was headed again for Butler Cabin, for another Jim Nantz interview marinated in familiar sanctimony. But even old Jim couldn't thieve the sense of tumult, the rumble of something epochal unspooling in north Georgia. A first Major win in 11 years drew more emotion, more animation from Woods than we'd seen previously. He seemed more human somehow, pulling children, Sam and Charlie, into tight, lingering embraces. His mother, Kultida, too. When he won his first Green Jacket 22 years ago, it was his dad Earl's arms he'd fallen into. "He shouldn't have come in '97," Tiger explained. "He had heart complications and wasn't supposed to fly. But he flew, gave me a putting lesson on the Wednesday night and... you know... the rest is history. "My dad's no longer here, but my mom's here 22 years later. And then to have Sam and Charlie here... for them to see what it's like to have their dad win a Major championship... I hope it's something that they'll never forget. "Because, you know, I had serious doubts that this could happen again after what transpired a couple of years ago. I could barely walk, I couldn't sit, couldn't lie down, couldn't do too much of anything. I think the kids are starting to understand how much this game means to me. "But, prior to this comeback, they only knew that golf caused me a lot of pain." Through the worst of that, this kind of day no longer seemed reachable to Woods, which maybe explains the catch in people's throats as he tapped in for bogey and a one-shot victory. Because Tiger brings a different noise. He "moves the needle" as Gary Player put it on Saturday. It almost ceases to be about golf, titles, trophies, even Green Jackets when his thunder starts to roll. There's something elemental about the connection he has with people. Woods injects a tingle into the elegant light of a place like Augusta, a boxer's energy almost. He scowls, he spits, he uses a docker's vocabulary. To watch him stride a Major fairway with the solemn demeanour of someone doing the stations of the cross shouldn't really feel like glimpsing art. But it does. In the history of sport, nobody's flaws have been parsed and analysed more brutally. It doesn't matter. In the media centre, the desire to see him win kept sparking little shell-bursts of favouritism throughout the afternoon. It wasn't difficult to understand. 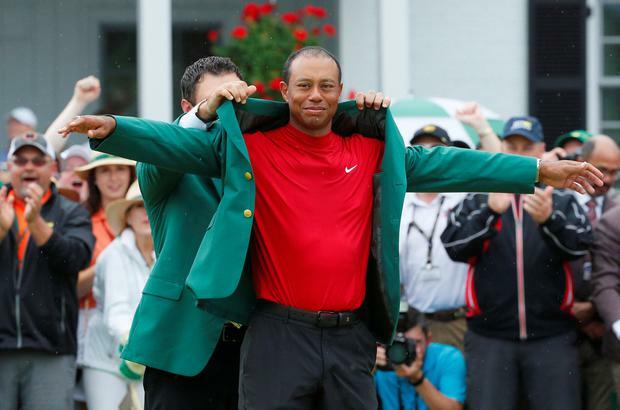 Few stories of moral redemption have followed a more spectacular arc than Tiger's. Just under two years have passed since his police mug-shot appeared on just about every front-page in the world. It was maybe a month after his fourth back surgery and he'd lost consciousness at the wheel of his Mercedes sports car after taking that extraordinary cocktail of drugs - Dilaulid (pain), Vicodin (pain), Xanax (anti-anxiety), THC (anti-anxiety) and Ambien (anti-insomnia). Back then, Tiger's predicament had become ineffably sad. He seemed so hopelessly distanced from days like this; from big leaderboard charges; from days when it felt as if the ground beneath him might actually be quivering to his stride. The truth is nobody gave a damn if he'd been caught in flagrante with every last cocktail waitress in Florida. And that's what we got at Augusta National. Even when bogeying five yesterday for the fourth time in a row - something he's never previously done with any hole at the Masters - there wasn't a concession of anything in that familiar pugnacious stare. He got the gap down to a single shot on seven, Molinari in trouble off the tee and Woods nailing his 146-yard approach to a foot. They both birdied eight, parred nine, Tiger bogeyed ten, then dug out a miraculous par on 11 after leaking his drive wide right into the pines. Even when wayward, Tiger's obstinacy was unblinking. And that's when you were reminded that no golf course on the planet gives witness to more sudden, destructive narratives than Augusta on Masters Sunday. Molinari became an 18-handicapper on the tee of 'Golden Bell', finding water for double-bogey. "The tournament kind of flipped there," Tiger told us later. Though they'd both birdie 13 and par 14, something seemed to have snapped inside the Italian now, shooting glances at a leaderboard that just wouldn't settle. If Woods and Molinari always felt like the marquee show, the old, wooden boards around the golf course kept on clicking out the story of a new twist. Incredibly, by the time the final group got to 15, Woods and Molinari had Xander Schauffele, Dustin Johnson and Brooks Koepka for company at 12 under. Jason Day was in the clubhouse one shot poorer, knowing deep down he'd just missed the train. And right there, on 15, was where Molinari finally crumpled, an errant drive leaving him trying to make the green in three. He couldn't do it. More water and another double-bogey for The Open champion. He won this tournament in '97 by 12 strokes, a record 44 million Americans (a 65pc increase on '96) tuning in to watch the final-round coverage on CBS. One year later, in the week of the Masters, he appeared on the cover of Sports Illustrated, posing with a 650-pound white Bengal tiger named 'Samson'. At his peak, nobody knocked the kind of percentages Tiger could. He would be No 1 in the official world rankings for 667 of 723 weeks from January '98 on. He'd win 34 tournaments, including eight Majors, while coached by Butch Harmon. He'd win 31, including six Majors, with Hank Haney. He won the US Open, despite a broken leg at Torrey Pines in '08. That, at least, was how we sold it to the world. In truth, it was a double stress fracture of the left tibia, but what writer sensibly waters down a cartoon hero? That's what his status rippled with back then. His 14th major at 32. A cartoon hero. Coming up 18, that was the backdrop to everybody's thinking now. There wasn't quite the rupture of marshalling control we'd seen at East Lake last September, but people just wanted to push close. "Now I know why I'm balding," he'd grin later in the media room. And Tiger Woods looked younger than he'd ever done.